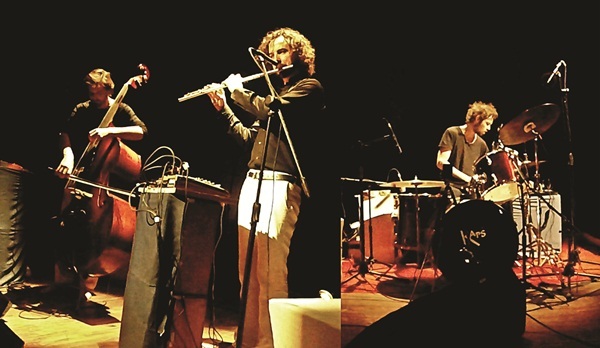 Piloot is a Brussels-based jazz and rock band formed by three friends. Aimed at promoting intercultural interaction through music, the two-year-old band is known to travel the world and collaborate with local artists. a�?The performances will be built around spontaneous compositions and improvisations,a�? says Florian Guibert, the flautist, who will be performing in the city with Cyrille de Haes (double bassist) and Jean-Philippe de Gheest (drummer), this weekend. And they will be collaborating with the Mandolin Sisters (M Sreeusha and M Sireesha). a�?We chanced upon a video of the concert of the Mandolin sisters and were completely blown away by their music style. That was when we wanted to to play with them during our tour,a�? shares Haes, while Sreeusha promises that we can expect a a�?combination of Carnatic and western classicala�? interchanging the ideas of different musical approaches. Their India debut, a five city debut, has already seen them perform in Delhi and Bengalurua��where they performed with Trippy Sama and Oceantidea��and next they will head to Ahmedabad and Chandigarh. They credit a performance with sitarist Smith Nagdev last year in Brussels, as the starting point of the Piloot meets India tour. In fact, they will be performing with her in Ahmedabad.